On Sunday, July 1, Eastern American Diocesan vicar Bishop Nicholas of Manhattan arrived at the Diocesan Center to take part in the feast day celebrations of the Holy Hierarch John of Shanghai & San Francisco, and to commemorate the ever-memorable Protopresbyter Valery Lukianov, whose fortieth day of repose would take place on July 3. 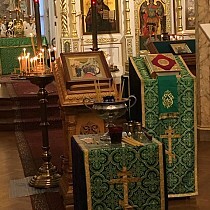 Оn Sunday evening, His grace led the All-night Vigil and reading of the akathist to St. John in St. Alexander Nevsky Diocesan Cathedral. 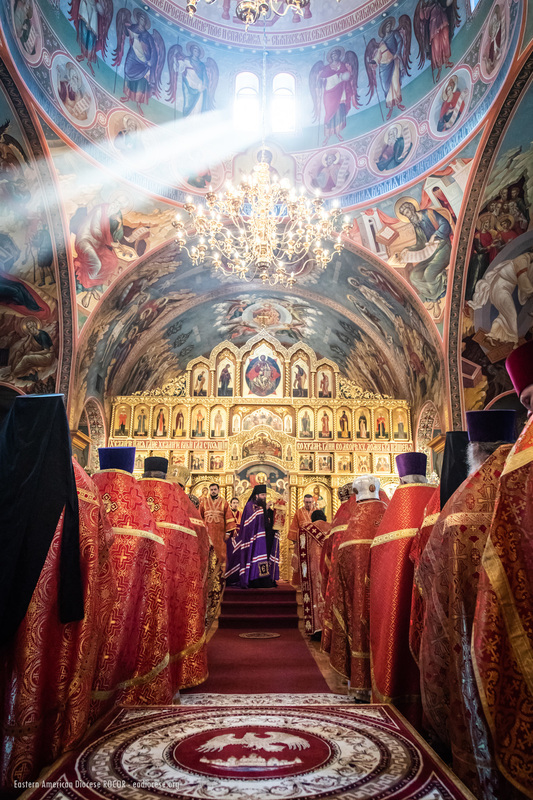 He was co-served by diocesan secretary and cathedral dean Archpriest Serge Lukianov and cathedral clerics: Archpriests Rafael Melendez, Boris Slootsky, and Seraphim Chemodakov, and Protodeacons Leonid Roschko and Paul Drozdowski. Praying in the church were diocesan clerics Archpriest James Dougherty and Deacon Andrei Psarev (cleric of Holy Trinity Monastery in Jordanville). 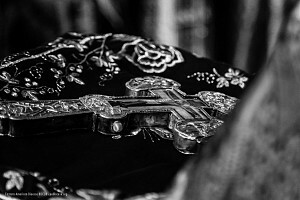 With the blessing of Bishop Nicholas, following the anointing, a skufia belonging to St. John and housed in St. Alexander Nevsky Cathedral was placed on the heads of the faithful. On Tuesday, July 2, as the Holy Orthodox Church commemorates the feast of St. John, the clerics and faithful greeted the hierarch, after which the Divine Liturgy began. Bishop Nicholas was co-served by cathedral and visiting clergy. A large number of clergy, spiritual children, and believers from neighboring churches and New York came to honor the memory of their beloved saint and pay homage to Fr. Valery. Many of them received Christ’s Holy Mysteries. At the conclusion of the service, Bishop Nicholas congratulated all those gathered with the feast and addressed them with a sermon, saying, in part: "Why do all love and respect St. John? Many of those living still remember him. He ordained Fr. Valery to the diaconate in St. Sergius Church at the Synodal Headquarters in New York City. He was the ruling bishop of the Western American Diocese, but often frequented parishes of the Eastern American Diocese and other countries. And, despite the trying conditions where he was, he prayed and saw the beauty in all things. He always helped his neighbor, whoever that was, and received many letters from people and answered them. "Saint John multiplied the grace of God with his life. We often forget that all of us have the seal of the Holy Spirit. During the fasts and feast days we confess and receive Holy Communion, but we do so mechanically. St. John celebrated Divine Liturgy daily, and firmly understood and deeply believed that he was uniting with Christ. These same thoughts must rest with us also. We came to pray and unite with Christ – so that this unification strengthens us in the remainder of our lives and that we may witness the beauty of God, as witnessed by St. John. We also must help others, just as our beloved saint did." His Grace shared his thoughts on the celebrations in honor of St. John in Joy of all who Sorrow Cathedral in San Francisco, which he had attended. Bishop Nicholas also asked the clergy to serve a panihida and commemorate Fr. Valery on the following day, and to never forget their preceptors, to imitate them, and to beautify their lives with virtues. 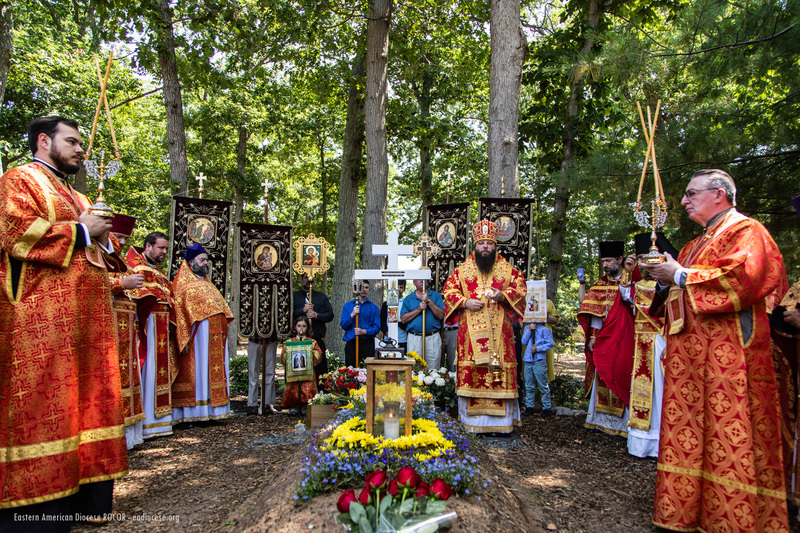 Afterward, with gonfalons and icons, the clergy and faithful proceeded to the gravesite of Protopresbyter Valery, where a litia was served. To honor Fr. Valery’s memory, Matushka Vesna Radovic (Serbian Orthodox Church) baked a special bread (kolach) and prepared a commemorative kutia, which was blessed by Bishop Nicholas along with Fr. Zoran Radovic. 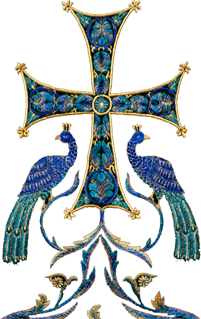 Later, as the faithful venerated the cross, Fr. Serge Lukianov placed the skufia of St. John on their heads and gave them a piece of the kolach and kutia. A memorial repast was prepared in the cathedral hall for all those present.